Arranging videos and photos in a space this or that way, we can get various views of stories, and reveal aspects that would have gone unnoticed otherwise. We walk among life-size figures appearing on illuminated boxes. The figures are frozen in gestures in certain emblematic moments and poses of their simple stories. The purity of the emotions and states of mind represented in the scene, and the abstraction of the mental and emotional positions in the still images through freezing and using plain colours without tones, allows us to identify immediately with the character that is hiding. 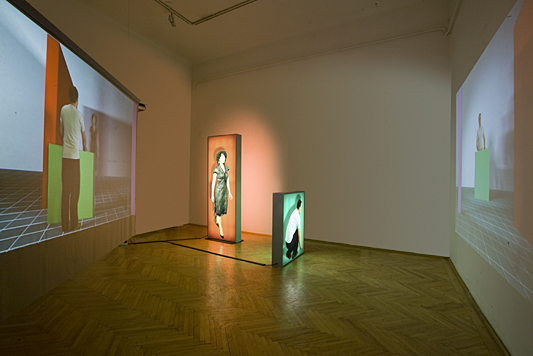 Due also to the size of the figures on the light-boxes and to the spatial arrangement of the boxes and the screens, we become parts of the space. First hand, emotional experience and involvement, but also some distance that allows observation and reflection at the same time.